On the Fourth of July in 1870 The New York Times noted that the Germania Life Insurance Company proposed to build “one building for offices” at No. 357 Bowery. The site was in the center of what was called Kleindeutschland, or Little Germany. Here immigrants, mostly German, crowded into tenement buildings and the streets around the Bowery and Third Avenue teemed with German music and social halls, beer gardens and theaters. The Germania Life Insurance Company was founded in 1859 by wealthy German-born New Yorkers. Its new headquarters, completed within three months of The Times’ announcement, was designed by Carl Pfeiffer, himself a German immigrant. The architect had recently designed the nearby Metropolitan Savings Bank on the Bowery and within a few years would be responsible for the Fifth Avenue Presbyterian Church in the heart of the city’s mansion district. The hefty red brick structure, costing $15,000, sat above a high basement. Ornamentation was reserved and nearly somber, relying mostly on creative brickwork. The building’s most eye-catching feature was its steep slate-shingled mansard with its angular triplex dormer. Germania Life Insurance’s first floor office was flooded in natural light that entered through the cast iron store front. Although The Times described the firm’s proposed headquarters as “for offices,” the upper floors would include small apartments for working class renters. It is possible that Germania Life purposefully misrepresented the building to side-step tenement building laws—like the inclusion of fire escapes. The apartments quickly filled. Three months after the building’s completion there were nine tenants—among them butcher William Bennett; insurance agent William Clifton (possibly involved with Germania); actress Geneva Withers; and Fred Stevens, who manufactured whips. Before the decade was up the increasingly mixed ethnic nature of the neighborhood was reflected in the tenant list: Wah Hing and Chung Kong ran a laundry business; Frank Goebels was a Prussian-born photographer; barber Henry Schalaifer was a German immigrant who lived here with his wife; John and Margaret Brown were from Ireland. A tailor named William was in the building in 1877. Even though Germania Life Insurance built and owned its handsome building, it merely leased the land on which it stood from the Doughty family. Ten years after construction was completed, the firm moved northward one block to No. 367 Bowery. The offices at No. 357 were taken by a dentist, most likely Dr. Adolph Faber who was still here in 1890. The doctor ran into trouble over a false tooth on May 29, 1886. On Friday May 28 Mary Nelson dropped off her damaged tooth for repairs. She came back the next day, accompanied by friends Annie Lawlor and John Hogan. She was visibly upset when the dentist informed her the tooth was not quite ready. The trio verbally assaulted the dentist and left, promising to return within the hour. As Hogan struggled to toss the doctor through the window glass, the officer emerged from behind the screen and attempted to arrest Hogan who “assaulted him and tore the wreath from his hat.” Hogan was nevertheless arrested and held at $500 for assaulting the policeman; the women were both fined $10 (about $225, today) by the judge. Two years after the ugly affair in the dentist’s office, the Bauer family lived upstairs. Valentine Bauer was a dealer in “wines, liquors, and beer,” and his little daughter Julia repeatedly was listed as the head of her class in Primary School No. 6. The Bauers would be in the building for at least a decade. Two years later, however, tragedy struck. The 54-year old experienced a violent headache late in February 1896. As the pain increased, his eyesight began failing. The thought of losing his sight again was apparently too much for the man to take. “With his failing sight his mind had weakened,” the newspaper said. On Mrs. Nabra’s request, two doctors from the German Hospital came to the apartment and examined him. They declared him “not a fit subject for their treatment” and left. The frantic woman then called for Dr. Charles Lellmann who advise the patient be sent to Bellevue Hospital. “The ambulance surgeon said that the sick man was insane and took him to the insane pavilion at Bellevue,” reported The Times. As the new century dawned, there were 22 tenants in the building. German-born George Baumiller was a hat maker and lived here with his wife Catharine and their seven children. Another trussmaker, Gustav Barth had moved in with his Hungarian born wife, Catherine, and her brother and sister. There were five Russians in the building at the time—a reflection of a new wave of immigration. At the same time, commercial tenants were beginning to take space. In 1903 the N.Y. Copying House moved in – makers of photographic enlargements. The former insurance office-turned dentist office was now a saloon. In February 1904 excise investigators swept the city for businesses selling liquor on Sunday. Their notes reported that “Otto Schmidt’s place closed on Sunday,” as the law required. As the men played pool, a stranger approached who bragged that he could beat anyone at the lemon game—a pool game by which the winner puts the yellow ball in the pocket. Jacoby, who made his living as a clerk, was urged by his new-found friend to play the stranger “for $2.50 a side.” He did. And he lost. Now the friend prompted Jacoby to double the bet and that he would help him win. Jacoby left the bar and withdrew $100 from a bank. When he returned the manager came to the table and offered to hold the stakes. When Jacoby gave the manager his $100, the other player told his friend to go get his money for him. After the game was played, all three men—the opponent, Jacoby’s new friend, and the manager—ran from the saloon. “I didn’t win,” replied Jacoby. “You must come to court with clean hands. The prisoner is discharged,” announced the judge. By now there were fewer residents and more commercial tenants in the building. In 1906 the Globe Hat Frame Co. was here and only Gustav and Catherine Barth were still living upstairs. In 1908 Adolph Wahrman got in trouble when investigators found he was employing a child under 16 years of age “without Board of Health certificate.” That year Charles Barkhauser was operating the saloon in the building. There was a brief resurgence of residential tenants by 1910—three families were living here including Alfred Sheppard, a cook, and five German immigrant boarders—two waiters, a cook, a horseshoer and a brushmaker—and the Russian-Jewish Harbeck family, Harry a clothing manufacturer, his wife Ida and their three children. In 1918 James S. Hull was here. He was the keeper of the Marble Cemetery on Second Avenue nearby. But by 1920 there were no residents left and the building was entirely commercial. Among the tenants were M. Perlman & Co.; L. Becker & Sons (Louis and his sons Jacob and Morris); and the National Crockery Company. In 1926, the Doughty family sold the property and three years later it was resold to the Laraia and Pellettiere families. They replaced the original rear extension with a full-height addition that extended to the property line and installed an Otis freight elevator. As the Bowery neighborhood was rediscovered by artists and musicians in the 1970s, the former factory spaces were quietly used as residences once again. One artist resident, Ingo Swann, partnered with Warren E. Spieker, Jr. in 1979 to purchase the building. Swann was more than a mere artist. Also an author and psychic he became well known for co-creating Remote Viewing with Russell Targ and Harold Puthoff. The process, which interested the Central Intelligence Agency, involves subjects mentally viewing a location with no more information than its geographical coordinates. Today the landmarked building has returned to its original purpose—commercial space on the first floor and apartments above. While a bit time-worn, it retains an astonishing amount of its original architectural elements—such as the original wood and glass entrance doors and the 1870 storefront. It is a remarkable survivor of a time when German was the prevalent language on the surrounding streets. For nearly a decade the brownstone St. George’s Episcopal Church steadily rose on Stuyvesant Square; originally part of the Stuyvesant farm, or “bouwerie.” Three years into its construction, in 1849, builder and real estate developer James Foster purchased a string of lots from Gerard Stuyvesant along 17th Street, wrapping around Rutherford Place. Within the next few years he constructed a row of houses along the 17th Street property; but he died before he could address the four Rutherford Place plots. They were purchased from his estate in 1854 by developers Thomas Morton and David Morehead who began construction on four identical brownstone-clad homes in 1855. Completed a year later the Italianate homes were typical of the high-stooped residences built for financially-comfortable families at the time. The family of William D. Drake was in the house by 1864 when son W. G. A. Drake was attending Columbia Collage. The days surrounding Independence Day the following year was significant in the New York. Not only had the Union had won the "War of Rebellion" three months earlier; of great importance to many Northerners, President Andrew Johnson had signed an executive order permitting the execution of four persons involved in the conspiracy to assassinate Abraham Lincoln on July 5. Residents and business owners decorated their buildings in bunting and American flags to exhibit their patriotism and support. When the Metropolitan Police released its list of highly-decorated homes in its “report of illuminations” on July 5, the home of William Drake was among them. By 1881 the house was owned by Francis (Frank) B. Austin. The Austin family shared the commodious house with Rev. Daniel C. Weston and his wife. Both Mrs. Weston and Mrs. Austin were members of the Colonial Dames of America and often worked together for the group. On March 2, 1892 Mrs. Austin nabbed top billing in the society pages when she entertained “the Russian Evening Circle.” The Times reported that “The parlors were decorated with palms and cut flowers.” Along with United States Navy Commander Chadwick and his wife, the guest list included some of the most elite names in New York society: Seward, Delafield, Haight, Van Rensselaer, Minton, Lawrence, Choate, and Chandler among them. Frank Austin sold the house on May 13, 1894 for $22,000—about $500,000 today. Reverend Westin and his wife Mary moved on, the Austin family went to their summer cottage on Long Island for the season, and the Jacob Stout family moved in. Stout, an alumnus of Rutgers College and President of the Stock Exchange, and was married to Hannah, the widow of William H. Neilson. The Neilson family had owned a house almost directly opposite No. 2 Rutherford place, and it was in that house that Josefa Neilson was born and grew up. Now 26 years old, the beautiful Josefa had married stock broker Robert A. Osborn the year before. Before too many years she would come back to Stuyvesant Square—the house in which her mother now lived, to be precise. Apparently the Stout family was close friends with either the Gillette or the Olney family (or both). When Amy Gano Gillette and George Harwood Olney were married on February 6, 1902 in a fashionable Grace Church ceremony, a reception “for relatives and intimate friends” was held in the house. The residence was briefly shared with the Pierce family—Henry Clay Pierce; his wife the former Minnie Charles Finlay; their son Theron Finlay Pierce and his wife. Another son, Roy Ensworth Pierce was living in Pride’s Crossing, Massachusetts. Although the sons were born a year apart—in 1883 and 1884—both received their Harvard degrees in 1906. Theron was a refiner and distributor of crude oils with an office at No. 25 Broad Street. It was about this time that the colorful Mrs. Josefa Neilson Osborn moved into No. 2 Rutherford Place. The headstrong socialite had “startled” society when her wealthy husband was financially ruined in 1898 and she went into business for herself. Under the firm name The Mrs. Osborn Company, Josefa established herself as one of the foremost gown designers in the nation. She augmented her income by writing fashion columns and designing theatrical costumes. Her attractive shop on Fifth Avenue, across from the fashionable Waldorf-Astoria Hotel drew the cream of New York society. Then in 1902 she got backing from Norma Leslie Munroe, the daughter of the wealthy publisher George Munro, and opened Mrs. Osborn’s Playhouse. Although her theater failed, she continued to thrive and maintained a summer estate on Long Island. By 1904 she decided her husband was no longer needed and filed for divorce. Her name was simultaneously appearing in court records as she and her former partner Norma Munro hurled back-and-forth lawsuits at one another. Munro had invested about $15,000 into the playhouse; although Josefa “stepped in and gave $10,000 to settle the debts out of her own pocket and the goodness of her heart,” said The Sun in 1906. Josefa Osborn was infuriated. She insisted that Norma Munro owed her $13,000 for gowns. “Of this sum $10,000 was money of the firm of the Mrs. Osborn Company, for which I am responsible. The remaining $3,000 was a personal loan.” Now she was poised to fight it out in court. The ugly legal brawl did not restrict Josefa’s creative impulses, however. She continued to design for and clothe New York’s wealthiest women. After her stepfather, Jacob Stout, died in 1907 she decided to bring the outdated house into the 20th century. She hired architect M. W. Holmes to revamp the lower two floors. On July 24 The Sun reported that her improvements “are to cost $7,000.” When Holmes was done, he had removed the stoop, added an extension to the property line, and swept the parlor level with tall casements behind stone balustrades. The windows were connected by a shallow arched filled with delightful sculptures of garlands and naked cherubs. The new extension created a capacious balcony with a stone railing at the third floor. Josefa Osborn would not live to enjoy her remodeled home for long. In October 1908 she was operated upon for appendicitis. A second emergency operation was performed on November 9; but she did not recover. The fortune that Josefa Neilson Osborn left was estimated to be around half a million dollars—a hefty $9 million by today’s standards. The entire estate went to her 14-year old daughter, Audrey. The house would see the comings and goings of a succession of owners. In 1922 Charles R. Sommer sold the home to Salvatore Sitaler. In the early 1930s it was home to Frederick J. Powell whose funeral was held here on May 18, 1935. In 1939 the house was leased to Dr. Leon Adler and it may have been at this time that a separate entrance and doctor’s office was installed at street level. By mid century it was home to the Finkel family. Morris L. Finkel retired in 1948 after 40 years in the advertising department of The Jewish Morning Journal. The family was still in the house in the early 1950s. Josefa Neilson Osborn’s entrancing make-over of a Victorian dowager is thankfully intact—a delightful curiosity in a neighborhood steeped in history and architecture. In 1869 sculptor John Quincy Adams Ward’s ground-breaking statue “The Indian Hunter” was unveiled in Central Park. It was notable not only because it was the first work by an American artist in the park; but because the subject was a uniquely American subject. Ward depicted the hunter and his dog in truly naturalistic poses; a stark departure from the neo-classical style Victorians were accustomed to. It was just the first of four bronze statues Ward would execute for the park. Three years later Ward’s statue of William Shakespeare was installed, followed two years later, in 1874, by his Seventh Regiment Memorial. 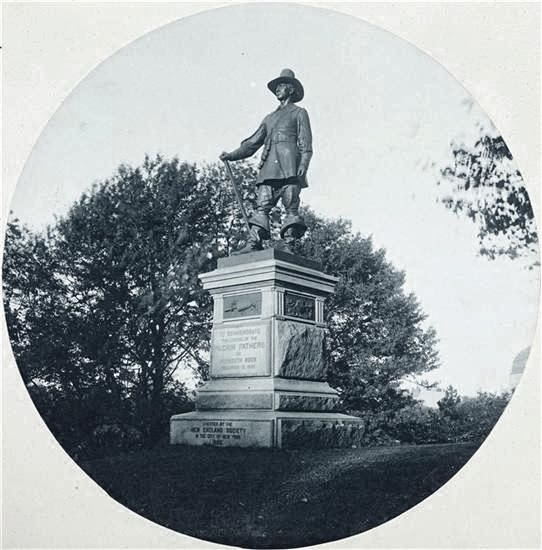 Now, in 1884, with its 75th anniversary approaching, the New England Society commissioned Ward to design a monument to the Pilgrim fathers who landed in Massachusetts in 1620. The Pilgrim stared off into the distance while his right hand rested on the muzzle of the flintlock at his side. “The face is eminently characteristic of certain New-Englanders, wince it is handsome in feature but not amiable in expression. It is a fine face with a discontented and somewhat sullen look,” said the writer. At the time of the article the Park Commissioners had not yet formally approved acceptance of the statue. Letters were received from the Presidents of the Metropolitan Museum of Art, the National Academy of Design and the New York Chapter of the American Institute o Architects; all of whom gave their support. On Wednesday, December 17, 1884 the Board voted, agreeing to accept the gift of the statue. Perhaps the bronze Puritan symbolically represented purity and morality for German immigrant George Bessendorf. Whatever the reason, he chose the statue as the site for murder-suicide just four months later. Inside were various letters; some of recommendation that proved George’s respectability, other were love letters from him to Maria. In several he acknowledged “that he had wrought the ruin of the woman, and expressed regret,” said The Sun. George apparently buttoned her dress after having murdered his loved one. He then shot himself in the chest. He held the pistol so close to his body that his clothing was on fire when Policeman Dugan arrived on the scene. At the turn of the century Warner Van Norden was a member of the Holland Society of New-York; an organization whose members’ Dutch ancestry was reflected in names like Van Schaick, Van Santvoord, Van Wyck, De Peyster and Hasbrouck. At the group’s 27th annual meeting, in 1912, Van Norden expressed his disappointment that the New England Society’s statue depicted a generic pilgrim; rather than a specific figure. The Pilgrim Statue stands atop a long slope which earned the name Pilgrim Hill. Over the decades the stern-faced Puritan has watched from his granite perch as generations of New York children sledded down the snowy slope. The Pilgrim was the first of Central Park’s statues to be restored when, in 1979, the Central Park Conservancy initiated its ambitious program to restore its collection of statuary. In 1999 the powder flasks, by now 115 years old, were recast and replaced. The group was eventually incorporated as the First Baptist Church; and a second congregation, The Second Baptist Church, was formed in 1791. Although records indicate that Henry Rutgers sold the newer congregation two lots “on the ancient farm of Hendrich Rutgers” on June 30, 1799; the group had already constructed a church there. The two-and-a-half story wooden structure sat on what was then Fayette Street and, other than the three entrance doors and high arched windows, did not look much different from the larger clapboard houses in the neighborhood. William Smith Pelletreau said frankly it was “a small wooden building in a style of the most primitive simplicity.” It took its name from its location, The Fayette Street Baptist Church. When, in 1819, Oliver Street was extended from Bancker Street (now Madison Street) to Chatham Square, Fayette Street became part of Oliver. The church was renamed the Oliver Street Baptist Church. A devastating fire reduced the building to ashes in 1843. The congregation rebuilt—using the designs of church member Isaac Lucas or, as the New York City Landmarks Preservation Commission believes, famed architect Minard Lafever. Three years earlier Lafever had dipped his toe into the uncharted area of Gothic Revival for his Reformed Dutch Church on Washington Square. If the architect of the Oliver Street Baptist Church was, indeed, Lafever, he returned to the more expected Greek Revival for the church building. In the 1830s and ‘40s, ecclesiastical architecture tended to emulate the temples of Rome and Greece. Classic triangular pediments sat above substantial columns with Ionic or Doric capitals. And so it was with the new brownstone-fronted Oliver Street Baptist Church, completed in 1845. Despite its rather diminutive proportions, its impressive Greek portico and pediment—stretching the entire width of the façade—gave the building an unexpected monumentality. Pelletreau, in 1900, was less impressed with the structure. “This vicinity, though somewhat thickly inhabited, was never a fashionable neighborhood, and the style of buildings was distinguished for cheapness, and want of durability.” Pelletreau was partly right. By 1845 the neighborhood was “thickly inhabited” and quickly becoming less-than-fashionable; and the congregation exercised frugality on the building’s materials. But there is no question on the durability of its construction—substantial walls of stone created a sturdy structure. The church reached out to its rapidly-changing community. Two years before the original building burned, a “Juvenile Singing School” had been organized in October 1841. The children’s singing school (later called the “choir school”) continued for decades. On November 15, 1851 The New York Times commented that a meeting of “the friends of the Madison University (Baptist) was held in the Oliver-street Church last week, to take measures for assisting in completing the endowments of that institution.” Further down the page the newspaper told of another Baptist organization. 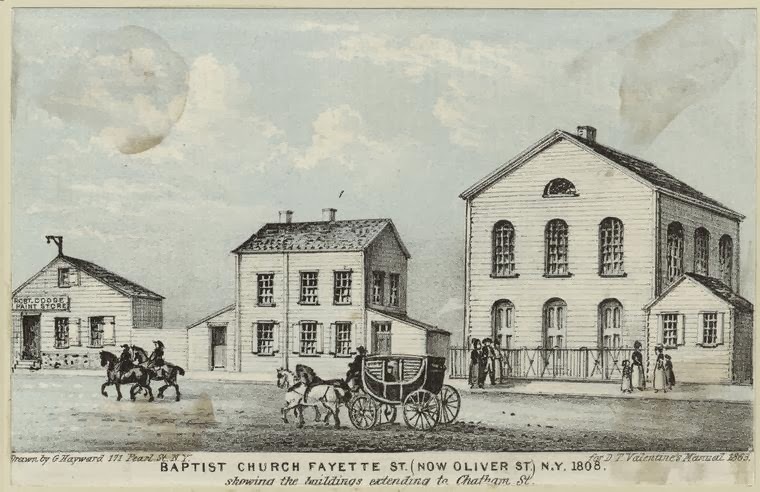 “The Baptist Mariners’ Church in New-York employs regularly ten missionaries, is composed of members from sixteen different nations, and received last month into its fellowship seven persons belonging to as many different nations.” The two churches would cross paths in a more substantial way a few decades later. The same year “an interesting discourse” was delivered in the lecture room by the Rev. James Tanner, a Chippewa Indian and a Baptist missionary to the native population of the West and Canada. The audience was less interested in Tanner’s missionary work as they were in his description of Native Americans. Another Baptist congregation chose a more fashionable neighborhood in which to build. 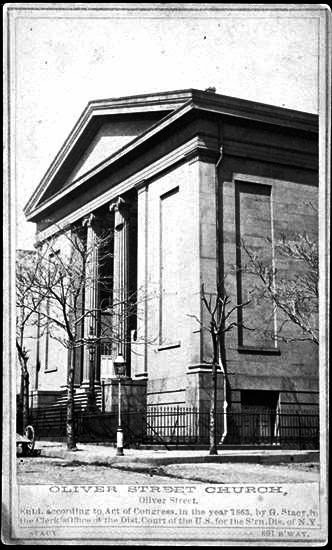 In 1859 the Madison Avenue Baptist Church erected a structure deemed by The Sun to be a “large and expensive church” on Madison Avenue and 35th Street. Indeed the building alone cost $122,000—about $2.5 million today. In doing so, the congregation overextended itself and before long was in deep financial trouble. The Oliver Street Baptist Church agreed to merge with the Madison Avenue church and contributed between $30,000 and $80,000 towards relieving its debt. 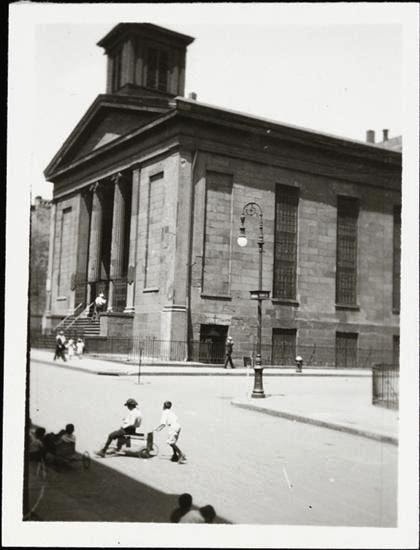 The Oliver Street building was sold to the Mariners’ Temple and the congregation moved northward to Madison Avenue. The Oliver Street Baptist Church then requested the deed to the other church’s property and the Madison Avenue church responded by bringing “ a suit of ejectment against the Oliver street church folks,” as explained by The Sun. A court battle ensued which dragged on for a full decade. The Sun, on February 3, 1873, said “For ten years past the congregations of the Madison avenue and Oliver street churches have met in amicable worship on Sundays, and fought in the courts on week days.” The battle was finally over when Judge Sedgwick ruled in favor of the Oliver Street Baptist Church. “Annoying him” included firing pistol shots through the church windows, smashing the church bulletin board outside that advertised services, and threatening his life. Rev. Avery in desperation placed notices in the newspapers seeking protection. The hooligans would sometimes rush into the church to interrupt services. “Frequently during his most solemn exhortations a band of these youthful marauders will rush into the church like a tribe of Indians, shouting, ‘Rats!’ and ‘Are you here McGinty?’ and on one occasion they stole a new overcoat belonging to the minister’s son,” reported the newspaper. It escalated to physical violence when Rev. Avery left the church on a Monday evening that December to visit the Bowery lodging houses. Outside a Chinese boy, whom The Evening World called an “innocent Celestial being” was being bullied by a larger boy. Avery stepped in and “boxed the boy’s ears and sent the Chinaman away rejoicing.” He was about to discover that his good deed would incite the wrath of a mob. A group of street toughs crowded around him and one asked why he hit “the kid.” Before he could answer he was punched in the nose, eyes and mouth, resulting in substantial cuts. The Tribune reported “The work of the Mariner’s Temple is largely among the Italians.” A reporter followed one of the church’s missionaries as he distributed food in the tenements. The first stop was the home of an Italian immigrant family. The father had brought with him an eviction notice when he came for his basket of food earlier that day. He owed $10 rent. “He also had a certificate from a physician, saying that his little boy was ill with bronchitis, and should not under any circumstances be moved,” said the newspaper. “The house was a wooden shanty in the rear of a tenement-house. The apartment where the family lived had to be reached by means of a rickety stairway on the outside of the building. The stairs and platform at the top shook and swayed and seemed about to give away at each step as the visitors climbed up. The eaves of the house were long and hung down over the little windows with dingy panes of glass. The missionary could not help the family and in the end they wrapped the little boy in blankets and carried him out of the shanty to live on the streets. The violent conflict in the area was caused in part by the increased presence of Chinese immigrants in the neighborhood traditionally inhabited by Italians and Irish. The large Chinese population was devastated by the news of the 1906 earthquake and fire in San Francisco, home to another substantial Chinese community. The church’s outreach to the Chinese was extended in 1910 when the Chinese Rescue Mission was opened in September. A century later the neighborhood is still heavily populated by Chinese. While it is still home to walk-up apartments in low rent buildings; it is no longer the dangerous slum of the turn-of-the-century. During the 1960s the membership of the Mariners’ Temple drastically dropped—at one point numbering only 60. But through the efforts of the Rev. Suzan D. Johnson Cook and her “Hour of Power” noontime services, the church revived. Rev. Cook was, incidentally. the first African American woman to achieve the role of senior pastor of an American Baptist congregation. The perfectly-proportioned Greek Revival church is mostly overlooked—tucked away on a side street far from the business districts. Brothers Peter and Robert Goelet were two of Manhattan’s wealthiest citizens in the second half of the 19th century. 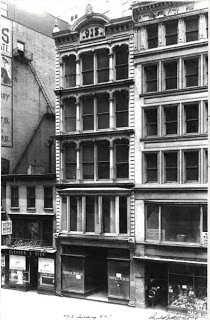 As the refined residential stretch of Broadway between Union Square and Madison Square gradually turned commercial; the men purchased property being abandoned by wealthy residents moving northward. 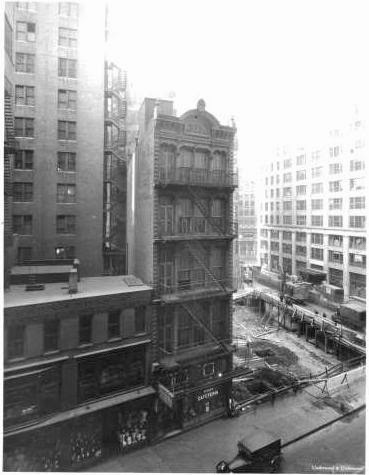 By either razing or renovating the homes to business purposes, the Goelet brothers took advantage of the changes taking place and multiplied their wealth in the process. Gilbert Coutant had a three-story residence constructed in 1838 at No. 913 Broadway. A wealthy grocer and lumber merchant who was also known as a “Tammany fixer,” Coutant and his family would live in the house for only eight years. In 1846 he sold the building to Peter Goelet. Now the brothers waited for the appropriate time to improve their property. Three decades later the time was right. Nearly all the grand homes of this section of Broadway had been replaced or renovated as commercial buildings (except for, oddly enough, Peter Goelet’s own mansion on Broadway at 19th Street, just a block south of the Coutant home). The brothers demolished the 36-year old house and commissioned architect Charles Wright to design an up-to-date mercantile building on the site. Wright turned to the recently popular neo-Grec style in designing his building, using equally-popular cast iron for the façade. A short flight of steps led from the sidewalk to the first floor. Above it all an ambitious cornice with pointed finials announced the address in giant cast iron numbers. Immediately upon the structure’s completion the haberdashery firm Union Adams & Co. took it over. On November 23 the store opened, a block north of the elegant Lord & Taylor dry goods store. Union Adams kept its original store at No. 637 Broadway opened through Christmas, offering customers the option of either venue for gift buying. 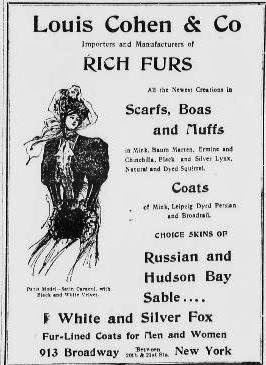 The article praised Adams’ taste in robes and smoking jackets, focusing on those “made of cashmere, heavily embroidered with silk, in a variety of patterns in the Indian style.” Shoppers could browse among driving mufflers, scarves and neckties, silk handkerchiefs (“now so much used”), hosiery, shirts, gloves, canes, umbrellas, walking sticks and American and French jewelry. For those households lacking a seamstress, the firm would custom-make linen items and embroider them to order. The renowned quality of McGibbons goods was enough to cause Anna Beach Appleton to hatch a scheme in 1894. She was living in the home of two sisters, Mrs. McDonald and Miss Maynard, at No. 172 East 74th Street. Realizing that she was unable to come up with the money for her board, she visited McGibbons & Co. Anna chose a pile of linens valued at $39, then casually mentioned to the clerk that she was the sister of ex-Judge Beach. With so reputable a brother, she was allowed to walk out of the store with her expensive goods (the $39 worth of linens would equal about $1000 today). Anna went home, paid off her board bill with crisp new linens, and everyone was happy. Until McGibbons & Co. looked for its payment. On January 24, 1894 Mrs. Anna Beach Appleton found herself in the Jefferson Market Police Court on the charge of obtaining goods on false pretenses. Her landladies were in court, as well, to testify about the linens-for-board swap she had concocted. 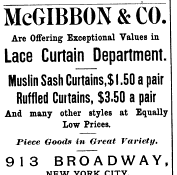 “Justice Ryan then ordered the women to return the linen to McGibbon & Co.,” reported The Times. As it turned out, McGibbon & Co. was the least damaged in Anna Appleton’s charade. “Mrs. Apppleton is also charged with obtaining on false pretenses $70 worth of goods from Adams & Co. and $300 worth from Stern Brothers,” said the newspaper. Peter Goelet had died in 1879, leaving No. 913 Broadway to his sister, Hannah Goelet Gerry. In 1890 she had the building updated—removing the stairs and installing a more modern storefront at street level. Sharing the building with the other upscale tenants was the Frederick Jewelry Company. The high-end retailers would remain in the building for several years. But by the time of the Great Depression the exclusive shops had all moved up Fifth Avenue. In 1932 No. 913 was purchased for $30,000—although it was assessed that year for $82,000. The new owners had a startling renovation in mind. Two years later, on November 23, 1934, Charles F. Noyes announced that he had leased the building to gift and novelties merchants Rubenstein Merchandise Company. But there would be changes made. "The property at present consists of a five-story which will be made over into a two-story structure," reported The Times. Noyes hired architect William F. Staab to alter the building. The top three floors were chopped off, resulting in a stubby two-story structure with little evidence of the original cast iron emporium. Staab installed a single-paneled parapet to cap the renovated building and modernized the sidewalk level. By the mid-1980s the neighborhood was reviving and in 1986 the former retail space became a restaurant, Indian Oven II; the first in a series of restaurants. Before the century’s end it would house Bar Zil, then in 1997 Theodore, a restaurant named for Theodore Roosevelt. One sliver of Charles Wright's cast iron design survives--somewhat miraculously. The first floor is still a restaurant today. At this level any trace of Wright’s emporium where wealthy gentlemen purchased reindeer gloves and later well-dressed women shopped for French linens has long ago disappeared. But above, somewhat miraculously, the 19th century lives on where the cast iron façade survives nearly unblemished.